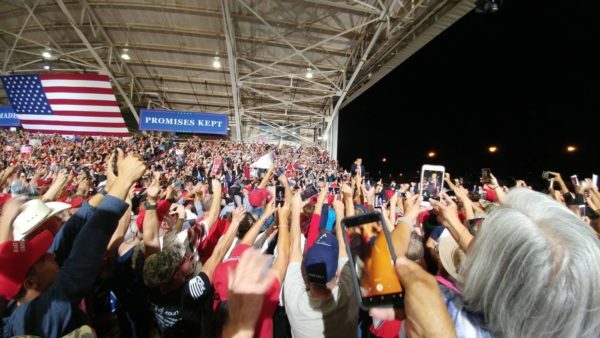 This report follows an earlier report on the “opening acts” at the 19 October 2018, Mesa, Arizona, MAGA rally. The event started after a significant number of people were in the hanger, but while people were still being admitted both into the hanger and then into the overflow viewing area. The organization and execution of the event reflected great professionalism and experience. 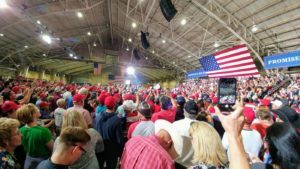 This set the stage for a successful appearance by the President and Senate candidate Martha McSally, both of whose performances are worth noting. We do not have a Texas-size population, but Arizona punches way above its weight. Staging: Yuge congratulations to the City of Mesa, the Donald J. Trump MAGA event coordinators, and especially the Mesa Police Department! 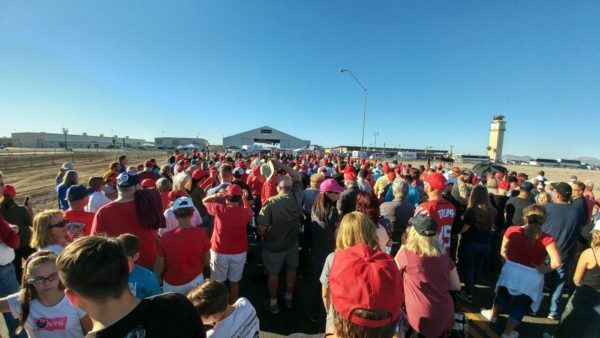 This event was at least double the size of the 2017 Phoenix rally and had none of the leftist mob drama. To be fair, the choice of terrain favored law enforcement, and discouraged significant trouble, before or after the event. Instead of urban canyons, through which small groups could maneuver and strike, the venue was at the edge of a former Air Force airfield, with open desert on its border. The event was in the International Air Response hanger. This company uses a C-130 aircraft for everything from wildfire suppression to movie stunt support. They are to be commended for their willingness to provide the venue. The plane in the satellite map below was moved, for obvious reasons. The dotted route was where the line formed before it folded back on the other side of the street. “S. Taxiway” served as the call-forward marshaling route, described below. The addition of a major beltway (Loop 202) several years ago, passing near the Phoenix-Mesa Gateway Regional Airport, made access easy from anywhere in the state. The Mesa Police reported event parking was full by 3:50. Between the internal hanger crowd, and an external overflow crowd, watching a big screen, the Mesa Police Department estimated the crowd at 40,000! 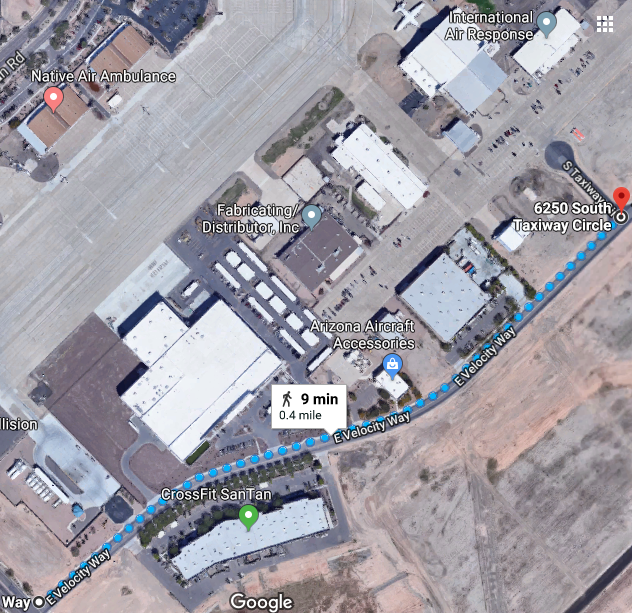 Mesa PD could confidently offer that estimate because of the metered clearance process used to move people through the Secret Service screening point. Look above at the base of the tower in the photograph. You see a group of people to the right of the tower, then a gap before the portable toilets. That group was called forward from the line, bending out onto the sidewalk from which the picture is taken. They are about 35 deep and 15 wide, by my counts. I believe this was intended as a 500 person increment measure. Further to the left, is a group held ready, to move to the screening point. So, 1,500 people were in the chute for entry at any given time. Hence the confident estimate by the police. As the crowd gathered, before screening started, the President and Congresswoman McSally, in her status as a member of the Arizona Congressional delegation, and a member of the House Tactical Air and Land Forces Subcommittee, held a round table discussion at Luke Air Force Base with local military and political leaders, as well as senior representatives of defense industries in Arizona. In that context, the President was able to point out the huge foreign military sales contract with Saudi Arabia, saying he did not want to jeopardize 600,000 American jobs by canceling the contract. He also pointed out that Saudi Arabia is an important counterbalance to Iran, so action must be taken, but the situation is not simple. President Trump does very well with this format, appearing to pull back the curtain on top-level government discussions. President Trump’s performance: A friend who attended the Mesa rally commented that President Trump has become a much better public speaker, with fuller, more flowing phrases. At the same time, he was about 20 minutes briefer than at the 2017 Phoenix rally. Most of the audience had been standing on concrete for over five hours, first in line and then in the hanger, before the President strode onto the podium, at 6:45 PM, shown below. He has become more disciplined yet remained loose, generating more sustained energy with the crowd. He spoke for just under an hour, including Martha McSally’s interlude. President Trump’s messages: The underlying message of the President, since his election, to which his cabinet officials will attest, is “Promises Made, Promises Kept.” This is what is uniquely virtuous in this Presidency. Campaign promises are not mere puffery. Voters have a right to get what you told them they would get. President Trump recited promises he has kept, pointing out he was keeping his word to the voters. He remarked as he has before, that other presidents have broken their word to the voters, and been punished at the ballot box. This is why he acknowledged that the wall is not done, then points out how much has been done, then says it could be done in a year if Congress will just fund it fully. Whether pointing out the extremism of national Democratic Party leaders, or the terrible treatment of Judge Kavanaugh, or the “migrant caravan” (which Laura Ingraham has now branded the “mobile mob”), and the lawlessness of our broken immigration system, the President was building the case that a vote for any Democrat is a vote for mobs. Whether pointing out the record low unemployment for everyone, especially people Democrats claim to represent, or improved military spending and strength, or removing job-killing regulations, the President was building the case that a vote for any Republican is a vote for jobs. So, vote for jobs, not mobs. This nicely makes the point: Sinema has truly radical roots, which she has recently, skillfully dyed a moderate shade. All the soft media treatment cannot make that “pink tutu” go away. Sure enough, “I was wearing a flight suit, and she was wearing a [audience joins in] pink tutu.” From here McSally moved to the issue she understands the MAGA voters of Arizona care most about: border security. After pointing out that Sinema voted to protect sanctuary cities, McSally named an audience member, whose son, Brandon Mendoza, a sergeant in the Mesa Police Department, was killed by an illegal alien driving the wrong way. The illegal alien had been in this country for over two decades since he was convicted of several offenses in Colorado but never deported. The slain officer’s mother wrote in outrage to President Obama but got no action and no justice. McSally closed on the note that there was so much at stake, and asked for Arizonans’ votes. Also in attendance was Arizonan Mary Ann Mendoza, the mother of fallen Sgt. Police Officer Brandon Mendoza, who had served 13 years with the Mesa Police Department when he was killed in a head-on collision by a highly intoxicated illegal immigrant with multiple criminal convictions. Ms. Mendoza shared her son’s story and spoke on behalf of the scores of victims nationwide who were killed because of unenforced immigration laws. There is so much at stake, we have so much more to do, so I ask for your vote, and if you elect me, I promise to work every day, for the next six years, with President Trump, to Keep Arizona Great! Summary assessment: The President is lending his full weight everywhere his team advises him there is a chance to win. This is a continuation of his presidential campaign strategy. The team gave him private polling and he made the calls on where to go. He understands which states and which districts are in play, as he did in 2016. He keeps getting better at his campaign rally performance, and the support team has the site preparation mastered. What is left is the performance of the local candidates. Martha McSally has the burden of the last two Arizona Republican Senators. Candidate Donald Trump endorsed John McCain in his primary, over Kelli Ward, only to be serially betrayed, culminating in the infamous thumb pointing on the Senate floor, marking a betrayal of 6 years of GOP promises to repeal Obamacare. Martha McSally has shown real integrity and courage in uniform, fighting the chain of command all the way into federal court to uphold the Constitution. Now, as a politician, she seems to be keeping her head down, trying to keep the “Never Trump” and “MAGA” voters both on her side. On the other hand, McSally is hitting her Democratic opponent as hard as her Republican primary challenger, which is a refreshing change. On that evidence, she is fighting to win. I believe it will be enough to win. I think it will be close, although the Democrats may yet help elect Senator Martha McSally by near double digits. A special note: for once, there was straight reporting by the Arizona Republic, whose article on the Mesa MAGA rally I highly recommend. Catholic girl. Married for 20+ years to the best man on earth. Mother of five + two, grandmother of 3. Perpetual student of philosophy (not a very diligent one, however), mainly in the school of Christian personalism. I am still trying to get my arms around his legacy, and his influence on me and my soul. I suspect I’ll be at it for the rest of my life—trying to sort and catalogue, organize and share my thoughts about his teaching, which seems to me key to everything. At least it is the key to understanding modernity—the mind of the Church in our day and time. I have also found it, mysteriously, key to my understanding myself and my spiritual journey—the meaning and “point” of the particular struggles I’ve faced along the way. 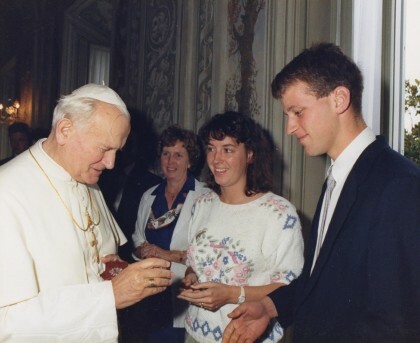 My initial impression of him as Pope, I think, was in the context of the culture wars. He stood for moral absolutes against relativism, and for lively, joyous faith against atheism. In college, I began to study him as an ethical thinker, through a course on the Nature of Love at the beginning of my courtship with Jules, when the impact of his thought was very existential. I came upon his poetry then, too, and his mysticism. Later, in grad school, I got to know him more as a Cold War hero—an ardent opponent of the evil ideology of Marxism and materialism and a fearless defender of the dignity of the human person. For decades I would say I interpreted him as a champion of the political and cultural right. And he was. But over the last ten years, I have begun to appreciate him more deeply as a champion also of the good causes of the left. He opposed authoritarianism, militarism, and social injustice of all kinds. He endorsed feminism. He stressed freedom. Above all, he directed attention to the subjectivity of the person. The miracle is that he did it while at then same time thematizing the objectivity of truth. His personalism subsumed right and left; objectivity and subjectivity; transcendence and immanence; modernity and tradition. But I’m easily perplexed when I try to present all these in right relation to each other and to the whole of his thought and witness. One thing I’m sure of though: The Church has hardly begun to realize the gift we had in him. Is he right? Are we past the point of no return? Or is there still an escape from totalitarianism, back to the idea of limited government, individual autonomy, and political process that doesn’t dominate our lives? Chairman Megrim: We’re down to the last four candidates for our final slot in the class of 2023. Professor Melena? Professor Caruncle: Etc., etc., etc. Grind, what are the numbers? Professor Grind: Zero. English, Scots, Irish, French, Swedish, and a touch of Bohemian. Professor Otitis-Medea: That white male’s not going to get the privilege of attending his first pick! CM: Okay, let’s get to the real candidates. PM: Elizabeth Herring. Valedictorian at Tomanchi High School in Oklahoma City, SAT of 1520, track, chorus, debate, volunteer librarian, and tutors ESL students. PG: 1/1024 Native American or possibly South American. PC: That’s it? Nothing else? PG: The rest of the DNA is English, Scots, Irish, French, and a bit of German. POM: Humph! I bet she’s really proud of that 1/1024! Well, she can take that to her safety school. CM: I hope the next one is better. PM: Yes, indeed! Maria Rainwater. Salutatorian at Cochise High School in Flagstaff, Arizona. 1420 on her SAT, swimming, math club, State science fair finalist, plays piano, speaks Spanish and … Chinese? Tutors Native American children at an elementary school. PC: Wow! Grind, is she full Native American? PC: How much? Half? One-fourth? PG: Her DNA profile shows 100% Asian. One-eighth Han Chinese, the rest various minority groups from Central and South China. POM: Let me see her file. Hmmm … Oh my God! Did any of you idiots bother reading this? She was adopted from China as an infant, and both of her adoptive parents are white! And she has the gall to think she can attend this prestigious university with a 1400 SAT. Typical Asian! CM: Is the last one any better? PM: I think so. Clifton Brown, 30th in his class at Booker T. Washington High School in Selma, Alabama. SAT of 1320, basketball and track. And the best part is that he has a CDIB card showing he’s 25% Chippewa. PC: Grind, is that confirmed by his DNA test? POM: Who cares about the rest?! Fellow members of the Admissions Committee, we have our last member of the class of 2023! PM: Uh, there’s one little problem. CM: What? Does he want to go somewhere else? We can give him some pretty nice incentives. PM: No, it’s just that there was a little accident with a javelin at his last track meet, and, well, he was in a coma for two weeks. He’s awake now and undergoing speech therapy, and I’m told there’s a good chance he’ll make a full recovery. PM: Well, we may need to wait until he’s fully recovered and put him into a later cohort. POM: Are you kidding me?! You’re going to discriminate against him because of a little injury! He’s even a better fit for us! African American, Native American, and handicapped! Think what he’ll do for our diversity! POM: Is there any chance he’s gay, too? Do Some in the Far Left Take Pleasure in Violence? It’s clear that many of the gutless wonders or calculating members of Congress, the Left-leaning media, and those who are indoctrinating young minds in academia are deliberately characterizing intimidation, mob behavior, and occasionally violence as “speech.” At the same time, they claim that speech from conservatives is “violence” … a glaring example of Orwellian “doublespeak”. Silence to condemn mob violence should be considered assent especially from those who are routinely before the public and on the airwaves. Making excuses for it, as some in the political and media class have done by declaring that Republicans who voted to confirm Brett Kavanaugh (Senate Majority Leader McConnell being the chief offender) have brought it upon themselves and is reminiscent of the charge that America itself was really to blame for the attack on 9/11 and the nearly 3,000 lives lost. If you think I exaggerate, give a listen to former left-leaning Prof. Janet Fiamengo (University of Ottawa) in this interview with Dave Rubin. At about 16 minutes into the interview, Professor Fiamengo’s references one of the pivotal moments that occurred in her academic career that forced her to completely reevaluate her ideological outlook when she describes the “barely contained vaunting pleasure” of her fellow academics at the University of Saskatchewan when they first learned of the 9/11 attack on New York and Washington, DC. This should be a cautionary lesson that radical Leftists not only adhere to an “ends justify the means” modus operandi in a matter-of-fact way but some actually take pleasure in mass murder to achieve their ends — in this case, radical Jihadists’ attempt to destroy western civilization, an aim with which Prof. Fiamengo’s colleagues were sympathetic because it was the effort in which they were also engaged. The lessons of the horrors of communism and fascism, even what’s happening in Venezuela currently, aren’t enough apparently to discredit those in Congress, the media, or academia who gleefully carry water for or endorse the ideology of the oxymoronic democratic socialism. For this is really the fight we find ourselves in. It’s not simply about the Supreme Court or Climate Change or a Woman’s Right to Choose. The core of all of this is the embrace of a movement bent on the complete destruction of a capitalist free republic by force if it cannot be achieved at the ballot box. When the Left characterizes any speech that runs counter to their ideology as violence, it’s clear that they are done debating ideas, no longer willing to compromise and not interesting in finding common ground on any given issue. The shift of the Democratic Party from the late 1960s onward from a fairly patriotic party to a party increasingly controlled by radical Marxists has been well documented. If Democrats don’t achieve the gains this November or in 2020, do you honestly think that they will moderate their rhetoric and behavior and begin working with Republicans to govern or that radical socialists will seize more control of the party, force unreliable wafflers like Senator Joe Manchin out of it, and openly support more violent tactics even if it means that many leave the party? Any guesses? While pondering that, one has to also ask, how many Leftist elected officials, so-called journalists, or those throughout academia not only find mob violence necessary to achieve their ends but take pleasure when they see people being hurt? The answer may be more disturbing than you think. The corrupt, phony media intentionally misrepresented how President Donald J. Trump referred to Senator Ted Cruz in the 2016 debates for the Republican nomination. I listened to the debate audio a number of times, then loaded it on my audio analysis decoder, which came standard on my Commodore VIC-20. The results? Big D clearly said “Lion Ted,” which is an honorific bestowed on political giants in the US Senate who have either killed an innocent woman (Ted Kennedy) or single-handedly derailed the repeal of Obamacare (John McCain). Big D should take the opportunity to set the record straight at the Ted Cruz rally in Houston tonight. The fake media has done the same thing with “Horse Face” Stormy Daniels, treating “Horse Face” as a derogatory term. Our great country has a long history of admiration, no, love, for leaders of the American equine community, like Mr. Ed, Trigger, Silver, Man O’ War, and The Black Stallion, a pioneer in equine racial equality. “Low Energy” Jeb, was actually meant as a compliment by Big D to laud Jeb for groundbreaking support for energy-saving home appliances, but the dishonest media portrayed it in a negative light. There are many more of these media misrepresentations designed to paint Big D as mean-spirited, but I am really exhausted from all this typing, and am now going to get some rest.